OpenScientist: Search for Alien Inelligence in Real Time! The search for alien life has always been popular with citizen scientists. The SETI@Home project kicked off the modern era of citizen science and amateur astronomy projects continue drawing the largest number of participants. In many ways it drives the field. Some of these projects have been around for 15 years now, so as the SETI astronomy field advances it is good to see the associated citizen science fields advance too. The most recent iteration of this is the SETILive project. Beginning just a few weeks ago, it asks participants to identify potential extra-terrestrial signals collected by the Allen Telescope Array. Although this 42-telescope operation is small compared to its ultimate 350-telescope goal, it already allows the collection of unprecedented amounts of radio data for the SETI project. It is currently targeting planets recently discovered outside our Solar System by the Kepler space telescope. So the odds continue to improve for a successful hunt for alien life. The idea for SETI Live came from a wish at the TED Conference. Speaker Jill Tarter requested a way "...to empower Earthlings everywhere to become active participants in the ultimate search for cosmic company." This ended up winning the TED prize and $100,000 to fund development of SETILive.org. If you aren't familiar with the conference, it brings together world class entrepreneurs, innovators, and entertainers to discuss world-changing ideas. The talks are always fascinating and ask users to press beyond their normal assumptions about what is possible. If you haven't watched the talks before it is well worth your time...each is usually less than ten minutes long and always involves an idea worth spreading. Just like we spread the SETILive.org project to you. Once the project funding was in place and the Allen array began collecting data, the project was set up as part of the Zooniverse series of citizen science projects. So you know a lot of thought has gone into building a high-quality, simple-to-use project. But enough overview, let's dive right in! Visit SETILive.org to read all about the project and learn more about the Allen Telescope Array. Register to join the project by providing your name and e-mail address, and by creating a unique password (you can also log in with your Zooniverse account if you already have one). Take a quick tutorial to learn about the radio signals and what to look for (don't worry...it only takes a minute or two to learn). 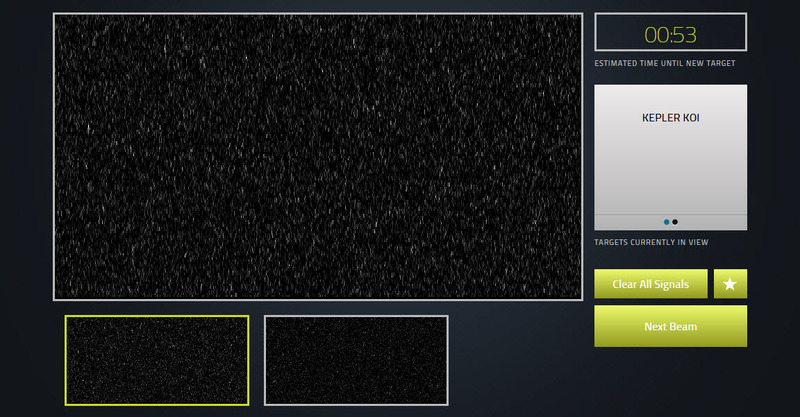 You're now ready to classify the radio signals. 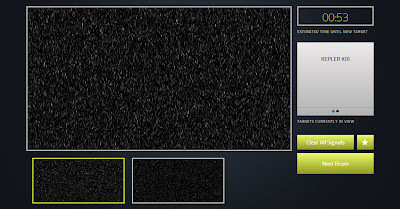 Below is an example of the first thing you'll see, a waterfall image of apparently random signals. Normally there are two "beams" of data collected...both are shown at the bottom with the selected beam highlighted above it. You can also see the planetary system targeted (middle right). 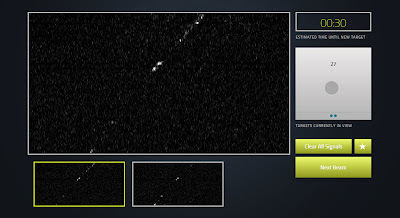 Unfortunately there are no interesting signals in this image so we click on "Next Beam" (bottom right), which turns into "Done" once the second image is shown. Next you will now see a new image like the one below, with an interesting signal crossing diagonally from left to right. This is what the human eye catches quite easily but is difficult for computers...which is why you're help is so important. To mark the signal, click on any part of the line created by the signal, as shown below. If it's not directly on the signal hover over the mark and drag it to the proper position. Now click on any other part of the signal. 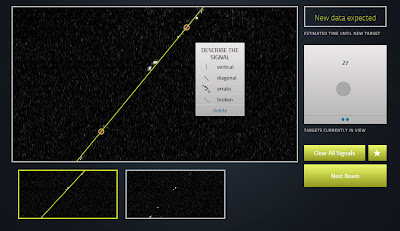 You'll see a line form across the screen and a dialogue box asking you to classify the line. In this case it is both "diagonal" and "broken", but we can pick only one, so I've indicated "broken". That finishes the first beam image. If you aren't satisfied with then answers just click on "Clear all Signals" to start over. Otherwise click on "Next Beam" to mark the second image (often it will be very similar, but not always). Once both beams have been completed, click on "Done". Finally, you will be asked if you want to discuss the observation (Yes/No). If so, you will be taken to a comment board where you can see your results and enter your thoughts for the science team. Otherwise you'll just be sent to the next set of images for classification. Once you get the hang of it the project moves along very quickly. Don't worry about running out of images though...there are many planets targeted at the same time and the array is always moving. Every 1-2 minutes a fresh batch of data will be collected for sorting. So there's no need to wait, just get started! Interested in other SETI projects? See the SETI@Home distributed computing project. Interested in the Kepler Space Telescope? See PlanetHunters, another Zooniverse project. Interested in finding extrasolar planets? See the Agent Exoplanet project.